What a beautiful effect for your stage act. If you perform for family audiences or on stage, consider adding this beautiful effect to your act. The magician displays some milk and subsequently vanishes it. 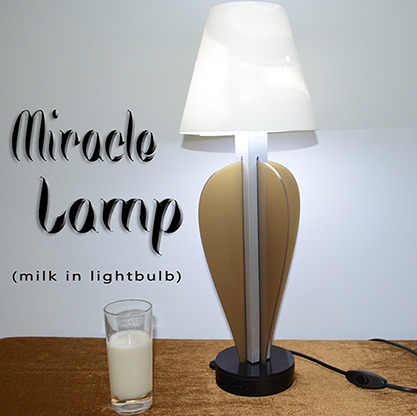 After the milk disappears, the magician removes the lampshade from a nearby lamp and unplugs the bulb from the holder. He then removes the cap and pours milk from the bulb into a glass! This lamp has a remote-control system and a standard cable for the power outlet. It produces a very bright light (not angle proof). It measures about 53cm in height and 20cm in width. The lamp and lampshade can be broken down into several parts for easy transportation. It assembles in less than 1 minute. Made of high quality aluminum and plastic, very light weight, practical to use. The light bulb (plastic) has a removable cap.